A true reflection of Indian cinema going global and presenting a breakthrough piece of filmmaking that will leave an impact with audiences the world over, the already acclaimed Aazaan releases in cinemas worldwide on 14th October 2011. A harsh and hard-hitting portrayal of an issue that continues to plague the modern world, Aazaan is a captivating story that delves into the global issue of terror, presented on screen by one of the key influencers among the new generation of pioneering Indian filmmakers, Prashant Chadha. Touted to be Bollywood’s biggest espionage thriller ever, Aazaan is set in one of the world’s now top five economies, India, but travels to international territories as far afield as Germany, Morocco, France, Poland, Thailand, China and South Africa, highlighting how a single seed of hatred can spread so rapidly across the world. Aazaan, with its global story, is India’s first truly international production, featuring an ensemble cast of Indian and foreign actors, and crew comprising editor Humphrey Dixon (UK); Oscar winning cinematographer Axel Fischer, BVK, who has captured the exotic locales of various countries; and presented by JMJ Entertainment on one global platform. Debutant actor Sachiin J Joshi as the character Aazaan has captured the contrast of emotions with a performance played to perfection. Adding glamour and beauty is Candice Boucher – the famous South African model, who plays the leading lady of the film. In a stellar supporting role is Amber Rose Revah (The Devil’s Double, From Paris With Love, Agora). A vision of JMJ Entertainment, Aazaan was created with a belief that Indian filmmaking can be on par with global cinema, so an international team of professionals was instrumental in giving shape to the film. The music of the film has been composed by stalwarts, Salim Sulaiman, who have rendered a memorable and haunting soundtrack that is creating waves across international playlists. India is a nation entrenched in contradictions and paradoxes. It is a country with a tenuous hold over its people, power and future, and is also one of the top five economies in the world. The country is a towering nuclear power, but at the same time deals with staggering levels of poverty. Aazaan presents the dichotomies and power struggles that face a nation as it strives towards modernism and a new identity, and how its socio-political issues have such staggering worldwide impact. 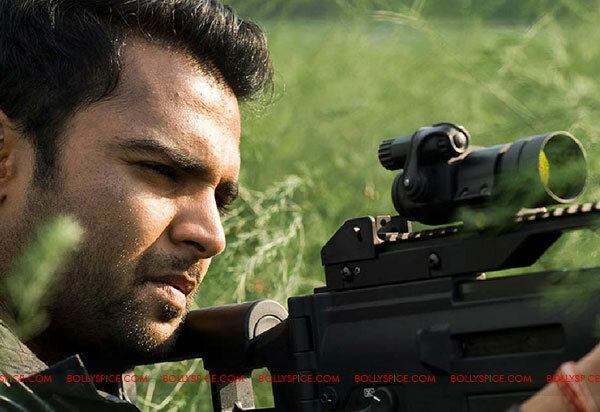 Aazaan Khan (Sachiin J Joshi) – a young, upright army officer working for RAW (India’s Research and Analysis Wing) with a mixed lineage of Afghan and Indian parents, as part of his duties, gets drawn in to the murky world of espionage only to find his younger brother a suspected terrorist. Torn between his love for his country and his brother, Aazaan embarks on his mission of unravelling a conspiracy of science and technology, which turns uglier when he realises that it stands to threaten the 1.2 billion population of one of the largest developing nations in the world – India. What unfolds is a fast paced story of one man’s determination to save his country against all odds of human defiance. Strengthening him in achieving his mission is his relationship with Afreen – a beautiful Moroccan girl who grounds him with human love and emotion to help him reach his goal. Touted to be Bollywood’s biggest espionage thriller ever, Aazaan is one of the most powerful offerings to emerge from the new stable of groundbreaking Indian films. It truly crosses international boundaries and presents a thought-provoking story that has relevance the world over. Releasing in cinemas across UK and worldwide on 14th October 2011.